How do I colour a 3D terrain based on its height? How do I colour a 3D terrain based on the height? Say, bottom green, and gradually to brown in the middle and white at the top. 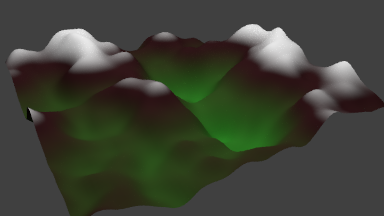 When I use colour ramp node, I can see gradient colour across the 3d terrain along x-y plane, but I'd like to have the gradient upwards, in x-z, y-z plane. You can use the Mapping node to rotate the texture on the Y axis, making the gradient vertical. You could also UV unwrap your mesh. I just had this issue myself, and I found that you don't need quite so many nodes. If you pass the "Texture Coordinate" node's Generated output to an XYZ seperator node, you can get values ranging from 0 to 1 for any of the primary axis. 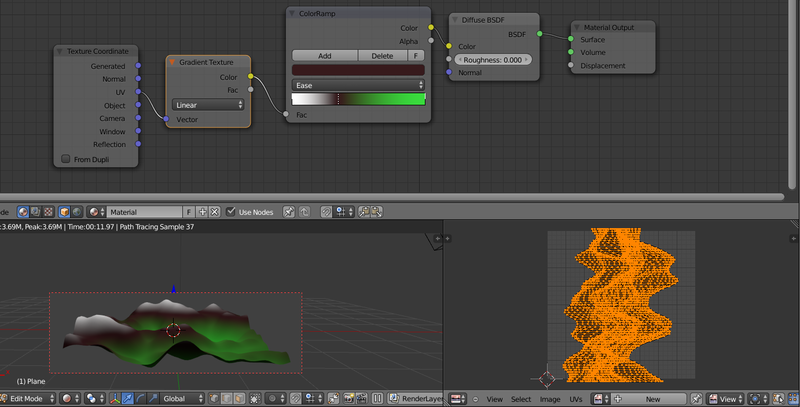 After that, you only need to pass the Z value output to the Fac input of the ColorRamp node. 0 will be the lowest point in the object, and 1 will be the highest point. Set the ColorRamp to the colors you desire, and pass its color output to whichever shader you want. This will also cut down on the processing required by avoiding the rotation action done in the Mapping Node. Not the answer you're looking for? Browse other questions tagged rendering cycles materials nodes or ask your own question. How do I assign a color ramp to a 360° axis? Blender cycles halo material on particles - how to texture?